Despite the fact that we see some evidence consistent with skill mismatch, it is far from clear that this issue is the smoking gun that explains the current anemic state of job growth...we have yet to find much evidence that problems with skill-mismatch are more important postrecession than they were prerecession. We'll keep looking, but—as our colleagues at the Chicago Fed conclude in their most recent Chicago Fed Letter—so far the facts just don't support skill gaps as the major source of our current labor market woes. A far easier explanation that falls out of the data is that there is insufficient aggregate demand. Let me be clear here. By insufficient aggregate demand I mean a lack of aggregate nominal spending created by an excess demand for retail and institutional money assets (i.e. the safe asset shortage problem). This is a problem the Fed could solve through better management of expectations. 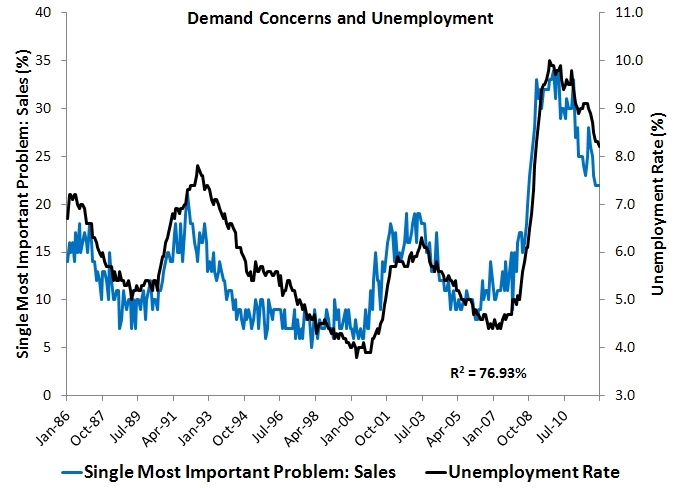 The Fed has failed miserably here and is therefore indirectly responsible for the labor market weakness. Recent posts by Mike Konczal and myself provide some of the evidence for the insufficient aggregate demand view. Here are a few highlights from those posts. 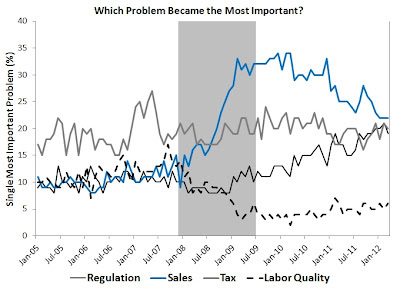 First, the NFIB's survey of Small Business Economic Trends has consistently reported the number one problem facing firms is not labor quality, regulation, or taxes. 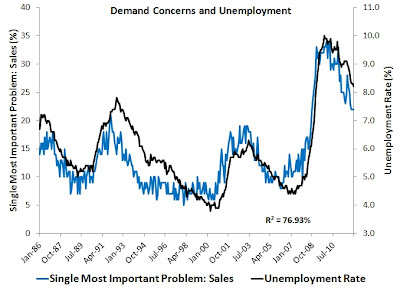 It is a lack of sales or demand. If the labor mismatch problem were as important as some make it out to be, one would expect to see labor quality be a bigger concern for firms. Occam's razor tells us that the simplest answer is sometimes the best. That and the lack of conclusive evidence for the skill-mismatch hypothesis indicates that we should probably take seriously the insufficient aggregate demand view. I felt like Altig buried the lede. Sometimes i feel like macroblog is a tad self congratulatory "look what great business surveys we do here in the sixth district!" BTW, i saw the interview and article in the WSJ about Capelli book. Unfortunately, i can report that its all true. HR policies in corporate America have become phenomenally rigid to the point where in some cases the hiring manager does not even get to screen resumes initially. 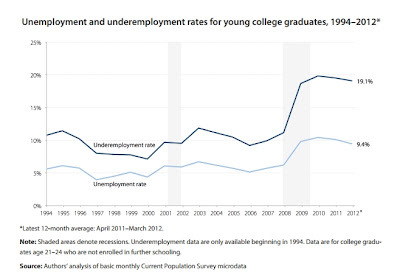 We are not hiring Walmart cashiers either: these are people with doctorates in econ and finance. the probability that HR knows enough technical detail to screen a resume is zero. less than zero. The anecdote where the HR exec applies for his own job and does not make the screening is not the most surreal thing I've seen... when labor demand is higher i guarantee hiring managers will push to make to process less cumbersome, because they will not be able to afford to wait, candidates will have multiple offers. Hmm, I am not sure about the dismissal of a skills shortage on the basis of survey responses. Probably, a reported shortage of demand takes prices as given, but if there were so many workers with the skills required by the firm that they could pay them less, the firm might be able to reduce its prices and then find demand. I am thinking, for example of industries like basic furniture manufacture, which must require quite skilled woodworkers, and has I believe been offshored from the US to Asia in recent years. To answer my own question, I took a closer look at the small business survey to find out more details about the questions asked. In fact, there is a question about "cost of labor", which, in the April 2012 survey at least, is an even lesser concern (only 4% of businesses reporting it as their most important problem) than "quality of labor" (6%). This suggests that small businesses do not feel that they could sell more by cutting their labour costs in order to cut their output prices. I am glad you answered your own question. 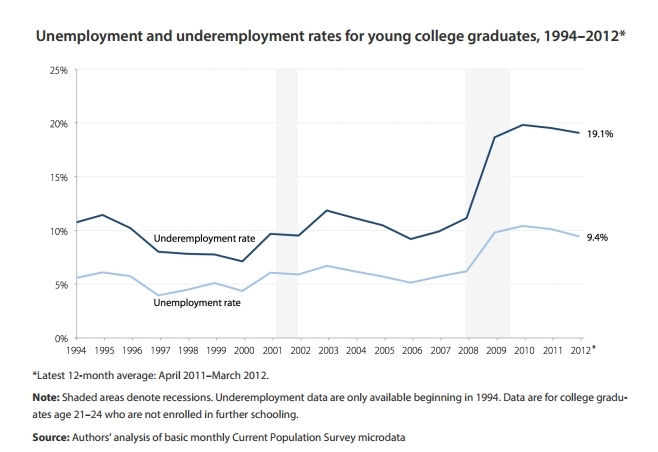 These surveys are cyclical, for example if you look at the historical time series for the manpower survey, difficulty finding workers in 2012 is no worse than 2006 or 2007 and only recently (2011) jumped back up to 2006 levels (the timing does not even match the recession period, there was little difficulty reported in 2008, 2009, 2010). When the economy is growing and employers actually have positions, employers report some difficulty filling them: so the data on skills shortages is procyclical. Even for highly skilled workers like people with MBAs, masters, doctoral degree etc, there is still a lot of a"OJT" or on the job training that US companies pay for (sorry to burst your bubble but a graduate from an MBA program spends the first several years as a glorified spreadsheet jockey with advanced pivottable skills). When demand for labor is higher, companies are more willing to train, whereas when they have 5-10 applicants for a position, they may as well wait for an applicant that happens to know all the internal systems. And, if you look at the top ten hardest to fill positions, as reported by the annual Manpower talent crunch survey, there is a substantial overlap in 2006,2007,2008... 2012 positions, and they include "drivers" and "administrative assistants." Thanks for your informative reply dwb, which is especially appreciated as I see so many of your comments on the blogs I read. I was surprised to note from the talent shortage survey that Japanese firms find filling jobs difficult.